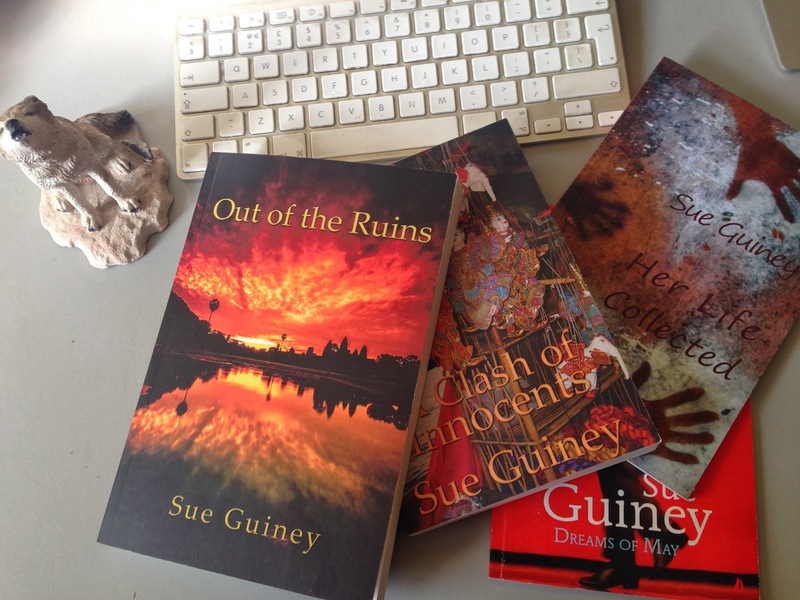 Sue Guiney is the British-based American founder of Writing Through, a charity working with children in Cambodia to promote conceptual thought and self-esteem, through the teaching of creative writing. Instruction is in English, so classes also help students develop fluency in a language that opens doors otherwise closed to them. Sue is also a poet, and a novelist. Her novels explore modern-day Cambodia. I met her in Singapore, to discuss both her philanthropy, and her writing. In 2006 Sue took her very first visit to Asia, when she joined a house-building trip to Cambodia. “I looked out of the tour bus window, and fell in love with what I saw.” She said. The schedule included a visit to an orphanage in Phnom Penh. “This was before there had been any publicity about treating orphans as a tourist attraction, yet the visit left me feeling conflicted and uncomfortable.” Her discomfort resulted in both her first novel, A Clash of Innocents, which explores ideas about innocence and guilt, set against the backdrop of Cambodia’s violent past and the beginnings of its new Tribunal for justice, and also in the founding of Writing Through. Sue’s novels have been well-reviewed in the West, but she laments the lack of popular interest in them there: “I’m writing literary fiction about a subject people don’t care about in the West.” Distribution is a constant problem – the books are not carried by chains selling mostly mass-market paperbacks, although more up-market chains, and independent bookshops carry them. In general, poetry sells even less well than literary fiction. Nonetheless Sue's publisher suggested she should write a collection of poems about Cambodia, and she is now in the middle of doing just that: "As a poet, I am much concerned with place, I am enjoying working on a themed collection with such a strong sense of place." As to Writing Through, that is going from strength to strength. In June 2014 the charity started working with French NGO Enfants Du Mekong, and it now works with 10 NGOs in total, and it is rolling out its programmes across Cambodia. It is building networks of enthusiastic volunteers, many of them based in Singapore, to provide funding, and support – some have even trained as workshop facilitators. If you’d like to get involved, check out the website, here. Details: Sue’s novels are published in paperback and eBook by UK-based publisher Ward Wood. They are available here. They are priced in GBP, so you’ll need to convert the price to your own local currency.